A cop was given the department's highest honor for the brutal slaying of a mentally ill man, but the video shows his actions were far from heroic. Los Angeles, CA — Connor Zion, 21, was in the midst of a psychological breakdown when he became violent and was subsequently killed. However, the manner in which he was killed has led to a federal court ruling that the police officer who killed him can now be sued for using excessive deadly force. After killing Zion in 2013, Orange County Sheriff’s deputy Michael Higgins was hailed as a hero. But a federal jury just found this week that his actions were to the contrary of what heroes do. Now, the taxpayers of Orange county will be shelling out hundreds of thousands of dollars to Zion’s mother, to pay for this alleged hero. Higgins did not stop using force and his actions played out like a scene from Grand Theft Auto. When a suspect falls to the ground after he’s been shot in the back as he fled, that suspect is, by most definitions, subdued and no longer a threat. However, despite collapsing to the ground after being shot in the back, Orange County sheriff’s deputy Michael Higgins felt it necessary to stand over Zion as he bled out on the ground and fire nine more shots into him at point-blank range. For good measure, Higgins then backed up, took a running start, and began stomping Zion’s face into the concrete. In 2014, Higgins was cleared of the murder of Zion, only days after Zion’s mother filed a $25 million wrongful death lawsuit. On the morning of September 24, 2013, Kimberly Zion received a call from her son’s roommate, concerned about the seizures Zion had suffered the past few days. She flew from her home in Washington and arrived at their Laguna Niguel condo later that evening. According to the Orange County District Attorney’s (OCDA) office, this is when things turned south. At the condo, Kimberly and the roommate discussed whether or not her son took his prescription medications regularly. Connor came downstairs in a rage and started attacking his roommate, eventually grabbing a knife and slashing his arm. His mom wrested the knife from her son’s hand and chucked it into a back patio chimney. Bleeding from her hand, Kimberly sought refuge in a neighbor’s condo. Around 7:30 p.m., the Orange County Sheriff’s Department (OCSD) received a call about a stabbed man bleeding in the street. Sheriff deputies–Higgins, and a Deputy Lopez–arrived separately on scene, when Connor reappeared with a knife in hand. (How he rearmed himself isn’t clarified in the report). As Zion reappeared with the knife, a chase ensued at which point Lopez lost his footing and fell to the ground. According to police, Zion then stuck him with the knife in his arm. At this point, Higgins pulls up and claims to have begun firing as Zion was still on top of Lopez. However, according to the non-cop witnesses, the situation unfolded differently. According to the federal lawsuit, Connor Zion didn’t stab his roommate, and that the cuts suffered were a result of an accident, not an assault. It further contends that Zion had separated from deputy Lopez at the time Higgins began firing. Indeed, the second video from Higgins’ own dashcam shows Zion running before any shots are fired. However, the OCDA cited Lopez’s injuries to his arms and says the video of the patrol car shows that all of Higgins actions were justified. As the federal court ruling illustrates, some people disagree. The disagreement was apparently so strong in the federal court that they made the unusual move to release the video publicly—uploading it to their own YouTube channel. 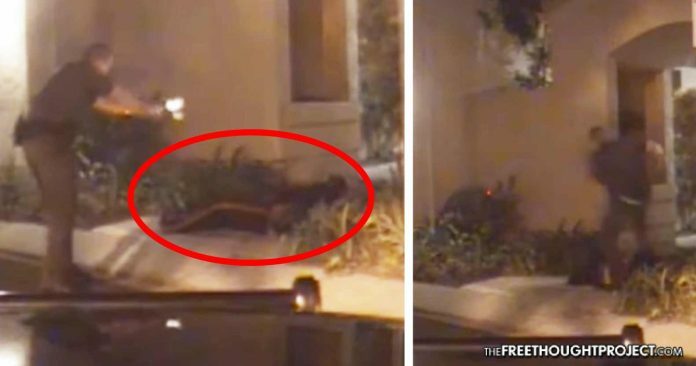 In the video, we see that Higgins initially fired 9 shots at Zion at which point he collapsed to the ground. Instead of moving in to handcuff the troubled college student and allow him to be tried for his crimes in a court of law, Higgins moved in as the judge, jury, and executioner. Zion appeared to have been wounded and was not making threatening gestures after being fired upon at “relatively close range” and falling to the ground, the court said. “While Higgins couldn’t be sure that Zion wasn’t bluffing or only temporarily subdued, Zion was lying on the ground and so was not in a position where he could easily harm anyone or flee,” Kozinski wrote. Regardless of Zion lying on the ground, Higgins proceeded to finish him off by emptying his magazine into Zion and then stomping on his head. If a suspect is on the ground and appears wounded, “a reasonable officer would reassess the situation rather than continue shooting,” the court said, according to the LA Times. “Like forced stomach-pumping, head-stomping a suspect curled up in the fetal position ‘is bound to offend even hardened sensibilities,’” Kozinski wrote, according to the Times. Now, Kimberly Zion will see semblance of justice for the brutal fate suffered by her son. As for Higgins who was cleared in 2014 for the killing, he was given the department’s highest honor, the Medal of Valor for Zion’s death. To add a point of reference, and illustrate what would have happened to Higgins if he weren’t a police officer, we can look at the case of Jerome Jay Ersland who shot and killed a masked robber in his pharmacy. He was given life in prison. Two female co-workers at Reliable Discount Pharmacy told jurors Ersland was a hero who saved their lives on May 19, 2009, as News Ok reported at the time. But prosecutors called him an executioner who shot a wounded, unarmed robber five more times after the robber fell to the floor unconscious and was no longer a threat. Just like Zion, Ersland’s victim was incapacitated and no longer a threat when he opened fire on him a second time. One is rewarded while the other is punished. This is the difference a badge can make.